Smartphones are becoming an inseparable part of people's lives. An argument can be, and has been, made that we are already cyborg's because of how dependent we are on one piece of technological equipment. Perhaps we aren't quite the Borg yet, but mobile is becoming more and more pervasive in most aspects of our lives. As expected newest stats from Nielsen support the fact too. 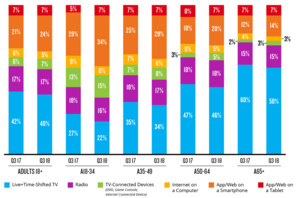 In every target group TV viewing went down while "App/Web on a Smartphone" went up. In adults 18 to 34 the trend was the strongest, as one can imagine. TV time reduced by 5 percent points to 22% and smartphones went up the same 5 percentage points to 34%. Unfortunately there is no data for teenagers, but one can imagine the mobile being much more dominant, perhaps capturing more than half of the time spent. A Sandvine study revealed ealier this month that YouTube is responsible for overwhelming amount of mobile traffic. 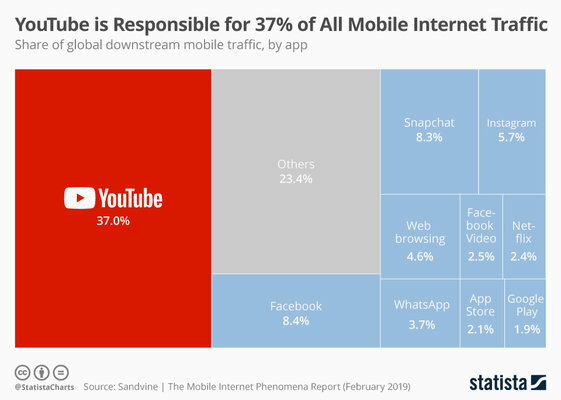 Even though Netflix is dominant in non-mobile traffic, YouTube captures a massive 37% slice of the pie in mobile. Second and third, Facebook and Snapchat, have around 8 percent shares, while Netflix is only at 2.4 percent. Perhaps people download Netflix show on WiFi connection and it isn't included.